As our International Taco party approached, I had been searching in my mind how to make for a week. Honestly, I love Mexican foods, but have ever tried to make tacos at home. I’m a big fan of beans, was glad that I happened to find canned Mexican Chilli beans, mainly used red kidney beans at Coles for sale yesterday. 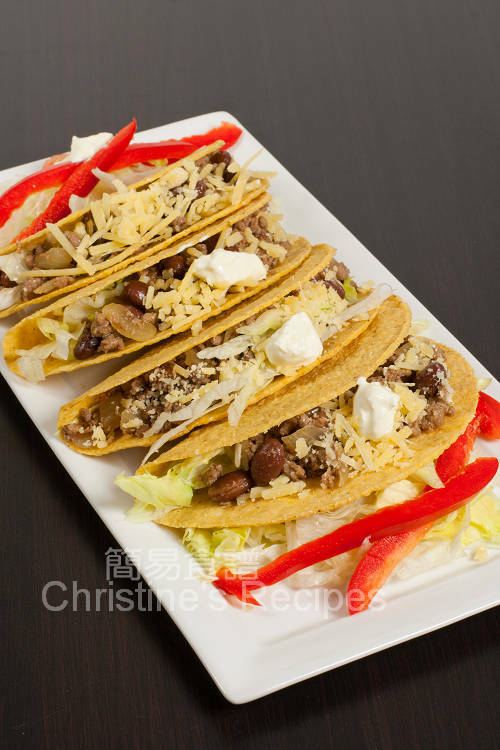 Something like this came up in my mind, “It’s not wrong to use canned food if they are of good quality or at good bargain.” So, I went for a short cut, saving much time to cook the beans, and finally made these Chilli Beef and Beans Tacos for a light lunch on last weekend. Mix beef with the marinade and the beaten egg well. Leave for 20 minutes. Heat 2 tablespoons of vegetable oil and melt butter over medium heat. Add diced onion and cook until aromatic. Add beef and increase heat to medium-high. Cook until almost done. 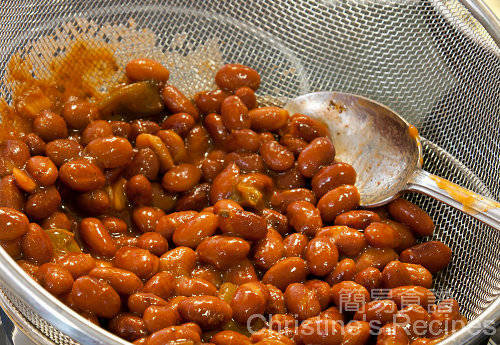 Stir in beans and mix well. Reduce heat and simmer for 5 minutes. Season with salt and pepper. Meanwhile, preheat oven to 180C (356F). 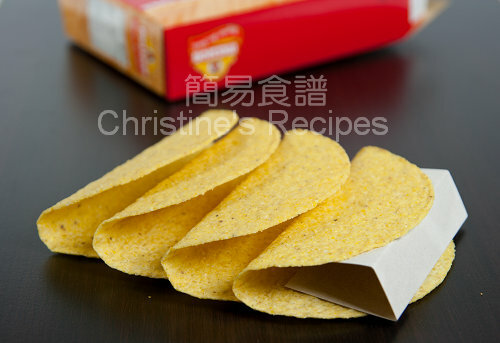 Place taco shells in preheated oven for 5 minutes. Remove taco shells from oven. 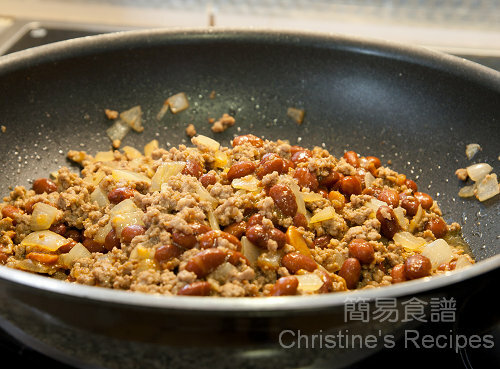 Use a teaspoon to arrange the fillings of chilli beans and beef in each shell. Fill as much of lettuce, capsicum, grated cheese and sour cream as desired. Beans always remind me of Mexican food and are great in tacos I think. I use canned beans many many times because I run out of time. Im sure you have read about it on my blog too.... happy birthday soon babe!! What a quick and tasty way to whip up a snack. Yum tacos! Yes nothing wrong with canned beans if it's accompanied by gorgeous tacos like this! I have no problem using canned beans in a pinch. It takes so long to cook beans properly from scratch. I agree with you about canned food. Using the canned beans would have saved you hours. Great pics Christine! A very Happy birthday to you. May the Lord bless you with the desires of your heart. I'm finding most Mexican fare so healthy if you avoid frying in lard ...these baked tacos look just perfect! Yes, I also like to use Canned food when I run out to time. Those tacos look so delicious and nice photography too. Ah the traditional taco...looks yummy. I used beans too. 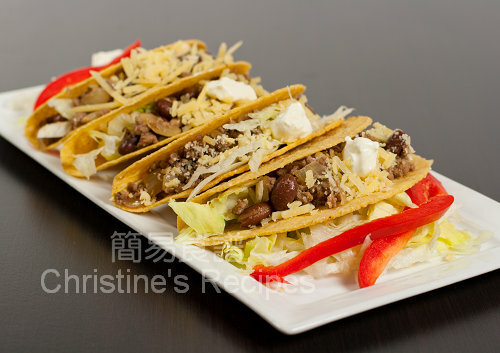 These sound like a great take on tacos...very delicious! This looks like a meal I sometimes whip on a weeknight when I'm after something quick but tasty. I love canned beans - such a time saver!